To provide technology resources and support services that enhance the academic, administrative, and co-curricular experiences of the Augustana University community. To provide technically current, adequate, responsive, reliable and service-oriented information technology resources to the students, faculty, and staff who rely on, trust and use those resources in support of the Augustana University mission and strategies. We strive to be a model information and technology organization recognized for proactive leadership, collaboration, innovation, and responsive customer service. Find support for areas you are interested in through the menu links. 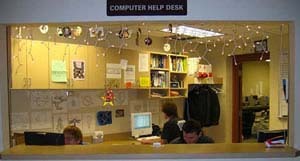 If there is information you cannot find, contact the Computer Help Desk.